At first Karen Joy Fowler’s We Are All Completely Beside Ourselves seemed a fairly straight forward story about family love and the emotional consequences of the loss of a sibling. But from page 77 onwards it changed course and became a much more interesting novel that raises searching and uncomfortable questions about consequences of quite a different kind — the quest for scientific advancement. Fowler’s particular focus is behavioural psychology experimentation involving human beings and animals. It’s incredibly hard to review this book without disclosing too much about the twist delivered on page 77. If you’re an astute reader you might have already worked it out from the various clues Fowler includes. If you happen to have a version of the novel published in North America, the cover actually gives a sizeable clue. But for everyone else, the watershed will be the discovery that Rosemary Cooke, the narrator, was one half of an animal-human behavioural experiment conducted by her psychologist father. The other half was her sister Fern. For five years Rosemary and Fern were raised as twins, frequently rivals for their parents attention but nevertheless inseparable. Then abruptly and without explanation they were parted. Rosemary, now a student in California, has never seen or heard of Fern since. As a result of an unexpected encounter with Harlow, a wild fellow student, she begins to examine the extraordinary early years of her childhood and its aftermath. She charts the family’s grief now Fern is no longer with them. Her father took to drinking heavily, her mother suffered a breakdown and her elder brother left home in anger. The family know he is still alive only by virtue of occasional cryptic post cards and the fact the FBI come calling for him. Rosemary has also undergone a radical change of character. One of the very first things we learn about her is that she was a great talker as a child, relentlessly telling stories and enthusiastically discovering complex words with which to pepper her stories. In contrast the Rosemary of today is reserved and directionless, unable to focus on her studies or her future. The void that was Fern has never been filled through any of her subsequent relationships. As she tells her story, you can’t help but recall Phillip Larkin’s comment in This Be The Verse on the dysfunctional effect parents have on their kids. Rosemary’s parents, despite being highly intelligent, seem not to have thought at all about the repercussions of their experiment on their real children nor the effects of its abrupt end on their offspring. One day every word I said was data, and carefully recorded for further study and discussion, the next I was just a little girl, strange in her way, but of no further scientific interest to anyone….What seems not to have been anticipated was my own confusion. “I wanted you to have an extraordinary life” Rosemary’s mother says. Extraordinary it was but as the book makes clear, happy it was not. Not for Rosemary and certainly not for Fern whose fate we come to learn of gradually. The revelations of Fern’s life post Cooke-family are some of the most disturbing and thought provoking sections of the book. The story is told in non linear flashbacks as Rosemary searches her memories to reach an understanding. She has many questions that have until now been unanswered. Why did the experiment end so suddenly and secretively when she was away at her grandparent’s house? Why will no-one in her family talk about Fern or explain what’s happened to her? Why is her brother on the FBI wanted list? She delves into fragments of memories to try to find the answer yet at the same time she questions whether what she recalls is actually real. How much faith can she really place on those recollections? The happening and the telling are very different things. That doesn’t mean the story isn’t true, only that I honestly don’t know anymore if I really remember it or only remember how to tell it. Language does this to our memories — simplifies, solidifies, codifies, mummifies. An oft told story is like a photograph in a family album, eventually it replaces the moment it was meant to capture. Piece by piece the story comes together in a narrative that mingles moments of reflection and grief with scenes of joyfulness and comedy. Fowler’s Rosemary is engaging, intelligent and witty, particularly when she talks of her earlier self and her predilection for peppering her conversations with complex words whose sounds she enjoys. Where the novel was less successful for me (and was in fact a major turnoff) was when it expanded beyond the individual story to describe the psychological theories behind the Cooke family experiment and show how Rosemary’s experience was not an isolated example. Karen Joy Fowler has said her plot was inspired by several real nature-nurture experiments from the 1930s and enriched by her own experience as the daughter of a professor specialising in animal behaviour. She enhanced it further with extensive reading and research. Herein lay the problem — instead of being seamlessly integrated into the narrative, the research gave rise to didactic sections which felt out of synch with the character of the narrator. I understand that in presenting the bigger picture she wanted readers to begin questioning the use of animals for experimentation purposes. I just wish she’d found a less obvious way of doing so. Even then I would have questioned what this book is doing on the Man Booker shortlist —it couldn’t have been for its literary merits since in places the text feels rather clunky and the form of narrative not that innovative. Did it make it because of its novelty value? Or because the judges were going for the ‘readability’ factor again? I sincerely hope neither of those explanations holds true but it’s a puzzle that they chose this in preference to Siri Hustvedt and David Mitchell. 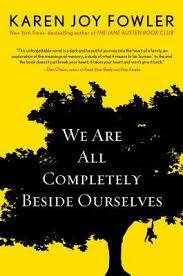 We Are All Completely Beside Ourselves by Karen Joy Fowler won the 2014 Pen/Faulkner Award for Fiction and was shortlisted for the 2014 Man Booker Prize. Published in the UK by Serpent’s Tail. Posted on October 9, 2014, in American authors, Book Reviews and tagged Karen Joy Fowler, Man Booker Prize. Bookmark the permalink. 9 Comments. Thanks for the review. I might have to pass. Like you, I don’t like didactic sections. You obviously don’t think it’s worthy for the Booker nomination. What will win on Tuesday? Sometimes I wonder about the awards books. I am not sure they are picked by any logical set of reasons. I read this and am also surprised it made the short list. I enjoyed (if that is the right word) the book but also found it awkwardly written. I am suitably intrigued, and as I have a copy of this on my kindle I may try to get to it soon. I have a copy of this sitting on a shelf somewhere but haven’t yet got round to reading it. I do know what the twist is – it’s hard to be around the book world without having stumbled on it – and it has made me remember a YA book by Peter Dickenson called ‘Eva’ which in a rather more extreme way explored similar issues. Do you know it`? I don’t know that one Alex. If it’s more extreme I wonder if I could stomach it…. You know, yours is the first review I have read of this book that actually told me what the book was about? Thank you! I’m still curious about it but perhaps I won’t rush out to read it. Really?? I’m usually well behind the pack so this makes a change.